** Due to Intel spec definition, DIMMs of DDR3-1800 or above are supported by specific CPU models only. The ASUS Workstation Series is the ideal foundation for a powerful PC. It delivers awesome power, dependable performance and unparallel multiple I/O scalability for the most demanding tasks and future upgrades. Also, it provide extreme power saving experience with EPU-6 Engine function. The ASUS Workstation Series intelligently reduces operation noise and dissipates heat through advanced and environmentally friendly methods to accommodate user needs. Don´t change yourself for a computer. Instead, let ASUS Workstation Series improves the quality of your work and life. 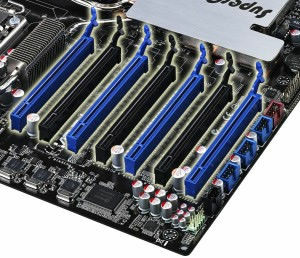 The motherboard will achieve outstanding and dependable performance in the role of a Personal Supercomputer when working in tangent with discrete CUDA technology—providing unprecedented return on investment. Users can count on up to 4 CUDA cards(One of them should be Quadro graphic card) that are plugged into P6T7 WS SuperComputer for intensive parallel computing on tons of data, which delivers nearly 4 teraflops of performance. It is the best choice to work as a personal supercomputer on your desk instead of a computer cluster in a room. No matter what your preference is, seven PCI-E Gen2 x16 Slots gives you the sufficient I/O interfaces to fulfill your demand for graphic or computing solution. You’ll be able to run both multi-GPU setups. The board features SLI on demand technology, not only supporting up to three graphics cards in a 3 way SLI but also supporting up to four double-deck GPU Graphics cards. Whichever path you take, you can be assured of jaw-dropping graphics at a level previously unseen. Brightly and vividly lighting LEDs shine around the ASUS brand name on the motherboard after successful booting process. With the breath-like deep blue lighting shining in regular tempo, ASUS Heartbeat makes the motherboard as vivid as life. P6T7 WS SuperComputer provides users with onboard SAS ports to support for hard drive upgration flexibility. SAS hard drive has safer, faster and more reliability for data trasfer and storage. 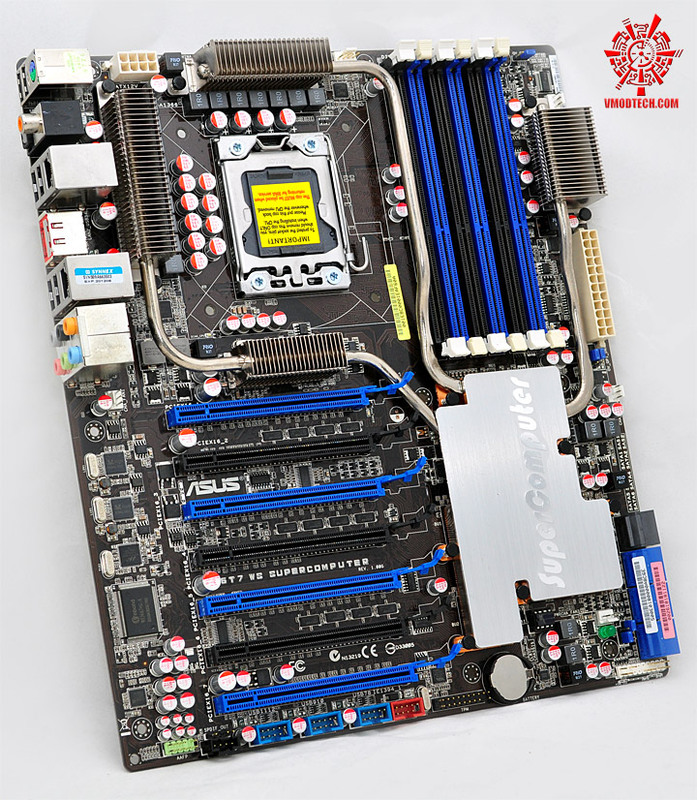 This motherboard is fully compatible with ASUS SAS card (the SASsaby card series, optional). Faster, safer and more stable, SAS will provide users with a better choice for storage expansion and upgrade needs. Diag. LED checks key components (CPU, DRAM, VGA card, and HDD) in sequence during motherboard booting process. If an error is found, the LED next to the error device will continue lighting until the problem is solved. This usr-friendly design provides an intuitional way to locate the root problem within a second. The 4 PCIe run on the speed of 16 links gives you the fastest and the most reliable 3-Way SLI graphic performance you ever have when you are engaged in Mechanical/Architecture/Interior/Aircraft/Audio/Video Design or when you are playing games in leisure time. 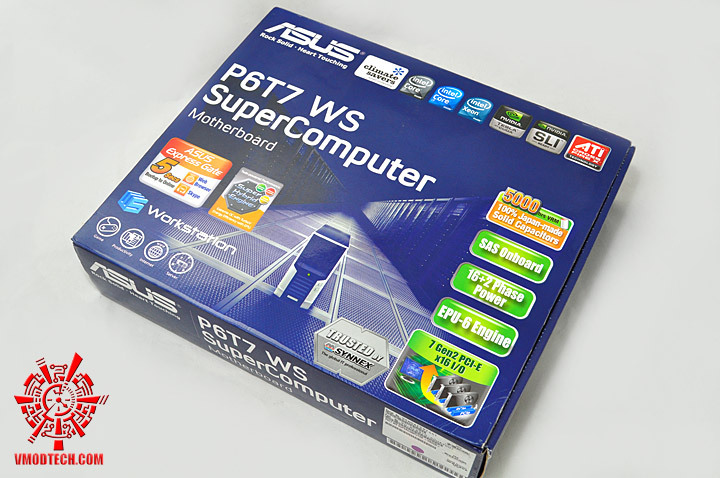 Bundled with the P6T7 WS SuperComputer motherboard, the G.P. Diagnosis card assists users in system checking by effortlessly and quickly providing precise system checks right after they switch on their PCs. This motherboard supports the latest Intel® Core™7 processors in LGA1366 package with integrated memory controller to support 3-channel (6 DIMMs) DDR3 memory. Supports Intel® QickPath Interconnect (QPI) with a system bus of up to 6.4GT/s and a max bandwidth of up to 25.6GB/s. Intel® Core™7 processor is one of the most powerful and energy efficient CPUs in the world. NVIDIA® CUDA™ is a general purpose parallel computing architecture that leverages the parallel compute engine in NVIDIA graphics processing units (GPUs) to solve many complex computational problems in a fraction of the time required on a CPU.With over 100 million CUDA-enabled GPUs sold to date, thousands of software developers are already using the free CUDA software development tools to solve problems in a variety of professional and home applications – from video and audio processing and physics simulations, to oil and gas exploration, product design, medical imaging, and scientific research(From www.NVIDIA.com). 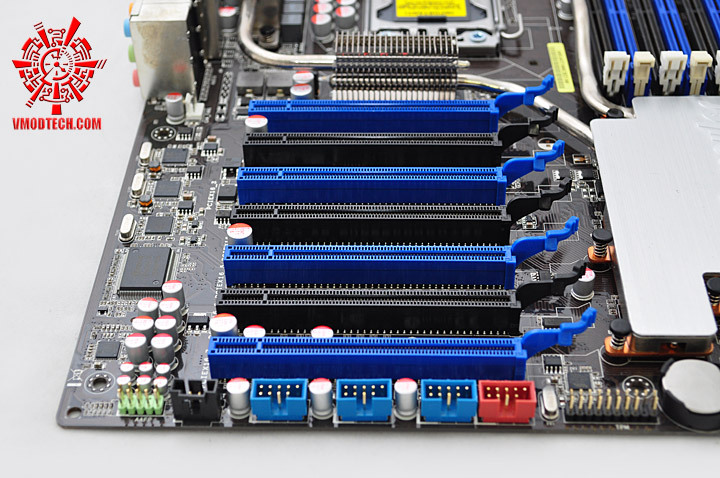 This motherboard supports the latest Intel® Xeon processors in LGA1366 package with integrated memory controller to support 3-channel (6 DIMMs) DDR3 memory. Supports Intel® QickPath Interconnect (QPI) with a system bus of up to 6.4GT/s and a max bandwidth of up to 25.6GB/s. It can support DDR3 ECC un-buffered memory. The Intel® X58 Express Chipset is the latest chipset designed to support latest Intel® Core™7 processors and Intel´s next generation system interconnect interface, Intel® QuickPath Interconnect (QPI), providing improved performance by utilizing serial point-to-point links, allowing increased bandwidth and stability. It also supports to 36 PCI Express 2.0 lanes providing better graphic performance. 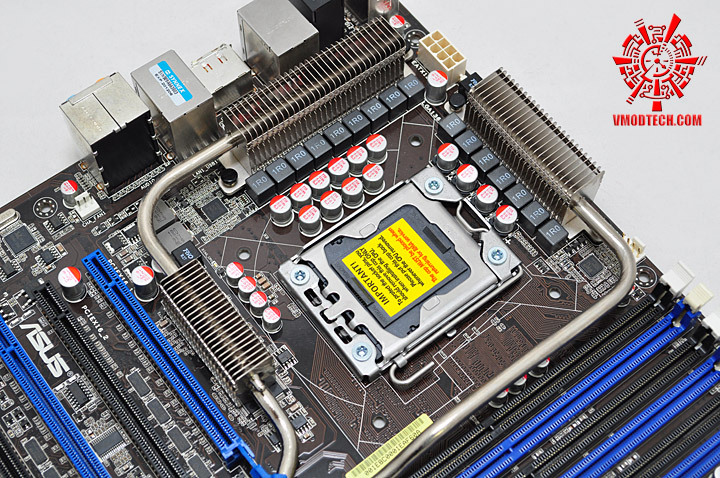 The motherboard supports DDR3 memory that features data transfer rates of 2000(O.C.) / 1866(O.C.) / 1800(O.C.) / 1600(O.C.) /1333 / 1066 MHz to meet the higher bandwidth requirements of the latest 3D graphics, multimedia, and Internet applications. The triple-channel DDR3 architecture enlarges the bandwidth of your system memory to boost system performance. The new ASUS EPU - the world´ s first power saving engine, has been upgraded to a new 6 engine version, which provides total system power savings by detecting current PC loadings and intelligently moderating power in real-time. With auto phase switching for components (which includes the CPU, VGA card, memory, chipset, drives and system fan), the EPU automatically provides the most appropriate power usage via intelligent acceleration and overclocking - helping save power and money. Low RDS (on) MOSFETs with min. switching loss & lower temperature, Ferrite Core chokes with lower hysteresis loss, and 100% Japan-made high quality, long life conductive polymer capacitors. The breakthrough technology of 16+2 phase VRM design is bringing to the ASUS motherboards. 16+2 phase power design (16-phase to vCore; 2-phase to vDRAM/QPI controller inside CPU) can reach high power efficiency, dispel heat generated by VRM module effectively, and lower more temperature compared to other VRM solution. With the high quality power components such as low RDS (on) MOSFETs, Ferrite core chokes with lower hysteresis loss, and 100% Japan-made high quality conductive polymer capacitors, ASUS 16+2 phase VRM design also ensure longer component life, minimum power loss, and help to reach the superior overclocking score ever than before. Taking only 5 seconds to go online from bootup, Express Gate is the one-stop gateway to instant fun! It´s a unique motherboard built-in OS. You can utilize the most popular Instant Messengers (IM) like MSN, Skype, Google talk, QQ, and Yahoo! Messenger to keep in touch with friends, or quickly check on the weather and e-mails just before leaving your house. What´s more, the user-friendly picture manager lets you view your pictures without entering Windows at anytime! With AI Nap, users can instantly snooze your PC without terminating the tasks. System will continue operating at minimum power and noise when user is temporarily away. It keeps downloading files or running applications in quietest state while you´re sleeping. Simply click keyboard or mouse, you can swiftly wake up the system in few seconds. Stack Cool 2 is a fanless cooling solution offered exclusively by ASUS. It effectively and noiselessly transfers heat generated by the critical components to the other side of the specially designed PCB (printed circuit board) for effective heat dissipation - making temperatures cooler by up to 20°C. The aesthetic heat-pipe design effectively directs the heat generated by the chipsets to the heatsink near the back I/O ports - where it can be carried away by existing airflows from the CPU or a bundled optional fan. This innovative and groundbreaking fanless heat pipe design effectively lowers temperatures by up to 10°C without having lifetime problems that a normal chipset fan has. Furthermore, it provides options for users to install side-flow fans or a passive cooler. This Heat Pipe design is the most reliable fanless thermal solution to date. The motherboard supports the next-generation hard drives based on the Serial ATA (SATA) 3Gb/s storage specification, delivering enhanced scalability and doubling the bus bandwidth for high-speed data retrieval and saves. The external SATA port located at the back I/O provides smart setup and hot-plug functions. Easily backup photos, videos and other entertainment contents on external devices. The onboard 8- channel HD audio (High Definition Audio, previously codenamed Azalia) CODEC enables high-quality 192KHz/24-bit audio output, jack-sensing feature, retasking functions and multi-streaming technology that simultaneously sends different audio streams to different destinations. You can now talk to your partners on the headphone while playing a multi- channel network games. All of these are done on one computer. The Intel ICH10R chipsets incorporate Six Serial ATA connectors with high performance RAID functions in RAID 0, 1, 10 and 5. 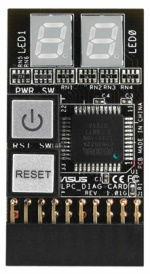 The JMicron controller provides another two Serial ATA connectors for RAID 0, 1, and JBOD functions. This motherboard is the ideal solution to enhance hard disk performance and data back up protection without the cost of add-on cards.